Climate scientist Simon Donner was quoted in Wired, lamenting the politicization of science under the recently felled Conservative government. Individuals like Donner hoped that the change in government would mean “a new beginning for science” in Canada. Important to this discussion is not only a conception of Canada’s future, but also its past. Embedded within such hopeful aspirations is the assumption that science in Canada, as well as the technological infrastructure accompanying it, was once largely unfettered by socio-political or philosophical bias, and therefore could be so once more. Yet, has science or technology ever been free from politics? This week’s theme week dedicated to “Technoscience in Canada” aims to probe just this question. Whether one is referring to the controversies around climate science, or the heated debates on net neutrality and the TPP trade deal, it would seem that science and technology are hardly distant from ideological or governmental wrangling. The authors for this week will demonstrate that this tendency is not so new as one might assume. From the use of x-rays and blood tests on migrants, to Cold War military science, from the legacy of the independent telephone movement, to women and aviation, this week will present a number of viewpoints on the intersection of technoscience with politics in the broadest sense of the term. Although some of the posts for this week will address how federal and provincial governments have tried to harness science and technology for certain ends in Canadian history, we will define politics in a much more encompassing way. We hope to shed light on the ways in which the state has influenced the direction of science and technology. We also hope to reflect on the role of racial, cultural and gendered politics in forging conceptions of science and technology in twentieth-century Canadian history. For it was just this sort of politics that, perhaps ironically, shaped an idea of science and technology as somehow separate from social context, producing a “culture of no culture” as Donna Haraway and Stephen Shapin have described. With largely white, upper class men of European background standing in as the invisible arbiters of empirical knowledge and invention, science and technology were perceived of as somehow untouched by the messiness of the surrounding world—a world populated by racial and gendered ‘others’. This way of imagining science and technology as “nicely cordoned off from the venereal infections of politics,” requires work, however—especially when we consider the extent to which science and technology shapes the societies we inhabit, whether rhetorically, metaphorically or materially. Nowhere is this more apparent than in the history of Canada. “Canada has been a technological project,” Graeme Wynn writes in his forward to Dan MacFarlane’s recent book on the St. Lawrence Seaway, Negotiating a River. It has also been a scientific one according to Suzanne Zeller’s now classic study Inventing Canada. Significant to this scientific and technological envisioning of the nation is ideas of the future. 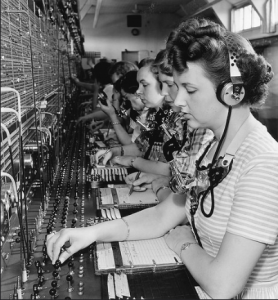 As Rob MacDougall will explain this week, for instance, those who viewed telecommunications as a means to safeguard the autonomy of local communities in Canada for decades to come spearheaded the independent telephone movement. This future could also be ominous, however, much as Matthew Wiseman will illustrate in his post that considers the history of weapons testing in Suffield, Alberta. Scott Campbell will discuss how a desire to thrust the nation into a new era of computational power could compel individuals to try and construct distinctive industries and standards of professionalization. Calls to protect Canada’s future could also justify the use of science and technology for the purpose of excluding those deemed undesirable, as Laura Madokoro will elaborate upon. These posts and more will demonstrate how science and technology have been put to work in our society, and not simply for creating shiny new pieces of equipment or interesting ideas about the natural world; rather, each author will draw out how science and technology have collided with certain political, cultural, and historical forces in Canada that have in turn shaped our understanding of the world and our place within it. Beth A. Robertson is an ActiveHistory.ca co-editor who teaches with Institute of Interdisciplinary Studies at Carleton University. Dorotea Gucciardo of King’s University College at Western is the new president of the Canadian Science and Technology Historical Association. Scott Campbell, Trans-border Data Flow and the TPP: Haven’t we been here before? DonnaHaraway, Modest Witness@Second_Millenium.FemaleMan_Meets_OncoMouse: Feminism and Technoscience(New York: Routledge, 1997), 23-41; Stephen Shapin, “Following Scientists Around,” Social Studies of Science 18, no.3 (1985): 533-550. Graeme Wynn, “Forward” in Daniel MacFarlane, Negotiating a River: Canada, the U.S. and the Creation of the St. Lawrence Seaway (Vancouver: UBC Press, 2014), xiii.